26.5 Million Residential Addresses! Royal Mail's Address Directory (UK) gives you EVERY UK residential Address either in a single postcode area (UB Uxbridge, B Birmingham, CV Coventry etc.) or in one central file containing EVERY UK residential Address. 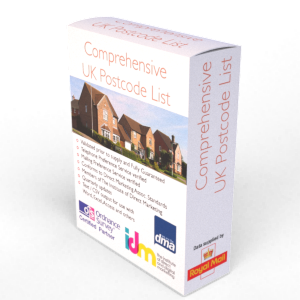 The Royal Mail's Postcode Address File (PAF) is without any contention the definitive most up-to-date and complete address database available in the UK. There are two residential product options: (1) the UK file which has every residential address & postcode in the UK (26.5 circa million addresses) OR (2) just the residential addresses in your postcode area. The Address Directory UK file covers every known address in the UK and extracts can be taken either by postcode area or as a full UK supply (28 million address locations across the UK). A sample of the Address Directory (UK) can be found above, this will also provide you with the data fields that are provided for each record. This residential file excludes 1.6 million business sites leaving circa 26.5 million addresses.